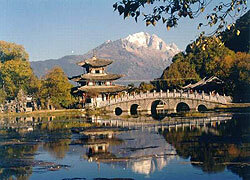 Yunnan is China's most southwest region, bordering Burma, Laos and Vietnam. It has beautiful snow-peaked mountains, lush rainforests with thousands of plant and animal species, gurgling valley streams and mountain rivers, and many natural beauties. Yunnan's capital is Kunming, otherwise known as "Spring City" due to its year round temperate climate. The small city consists of a residential area, a university district, a commercial sector and an old, previously walled section of the city. It is a city of considerable charm, long a favourite with tourists. Kunming's modernization began when the railway to Hanoi was built. Since then, Kunming rapidly developed alongside China's overall efforts to modernize. An international airport under development, the widening of roads, development of housing projects and the upsurge of corporate high-rises and luxury hotels is a sign of Kunming's growth. Unfortunately the modernization has much reduced the quiet and relaxed charm of the old Kunming, replacing many low-rise buildings with high-rises. Southern Yunnan has a tropical rainforest, and is the home of the Dai people, who have numerous festivals, celebrated throughout the year. In northern Yunnan, the beautiful old town of Lijiang is a wonderful oasis for travelers. Three small rivers course through the old town's cobblestone streets. Lined with lofty trees, quaint shops and delicious restaurants and cafes, you may spend a lazy Sunday people-watching while attending a musical performance played on period instruments dating back to the Han Dynasty. Another popular attraction in Yunnan is Dali City. Located in this ancient city from the 8th century are numerous spots of historic interest, including the Chong Sheng Temple, Three Pagodas and the smaller town of Shaxi found on the ancient tea route, also known as the Southern Silk Road. As a tea-producing region, Yunnan was one of the stops during the journey from India to Tibet. For the longest time, Yunnan was relatively cut off, as the surrounding mountain ranges made access difficult. This is why the province has been able to maintain its eye-popping beauty. Another place of interest is the Stone Forest located just outside Kunming. The Stone Forest is well known for its large gray rocks pillars forming a forest of stone. Many of the natural formations have taken the appearance of animals such as dragons, snakes, birds and elephants, and it is always fun to point out one from the other.